That’s what it’s been like here lately. We had the big snow storm. Then last Friday, about the time the big snow had finally finished melting, we got another little snow storm. It was only half an inch this time and it melted quickly. Now they’re saying we might get more snow this Wednesday. It’s a good thing I like snow. Actually I haven’t heard too many complaints about the snow. Usually we get more ice than snow so nice fluffy snow is a treat. 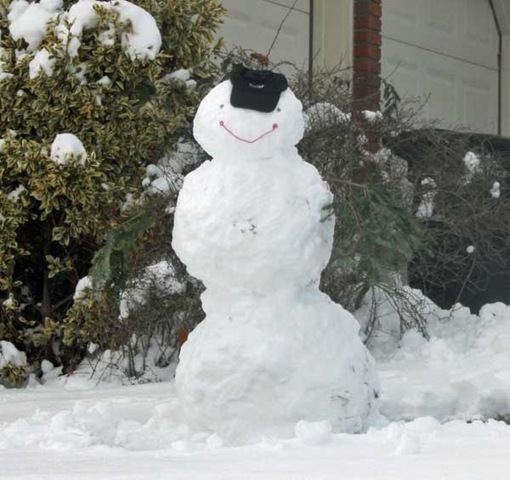 I just had to make a snowman after the big snow. The snow was just too nice to pass it up. Unfortunately the house is on a bit of a hill, which means the snowman was on a bit of a hill. As the week went on, he began tilting more and more downhill until he toppled over. It didn’t help that he was already a bit lopsided. When I put his middle on, it wasn’t quite centered but it froze instantly to the bottom part. It was fun though. I’m not sure if it’s the weather or just Dexter being Dexter, but he keeps stealing my newspaper and magazines and stashing them under the couch. I kept wondering where the Sunday paper and some of my magazines were going. I knew I had them, but I couldn’t find them. Then one day I spotted this. They were all under his lair under the couch. 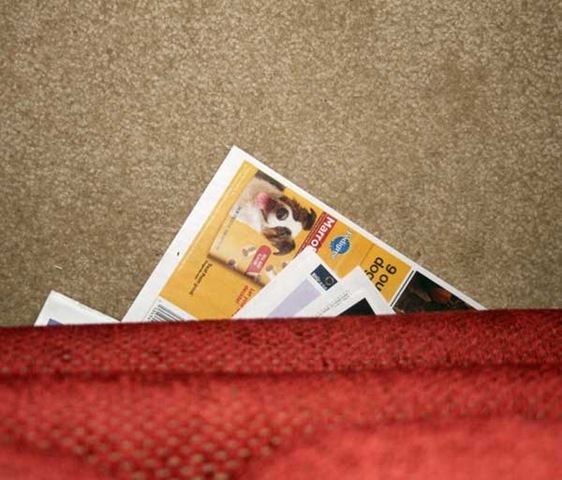 Now if I haven’t finished reading the Sunday paper, I have to put it out of ferret reach where he won’t steal it. Katie, on the other hand, has been glued to my lap. 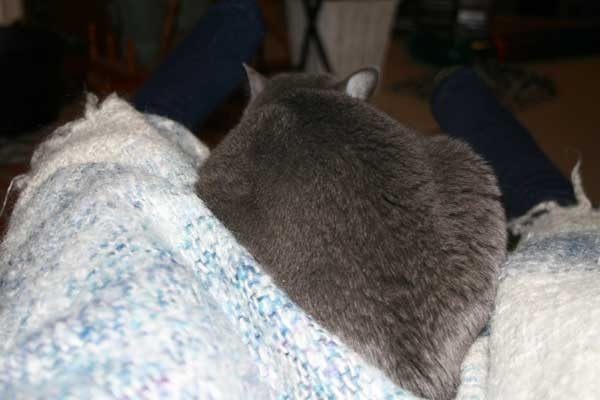 As soon as I make a lap, especially if I get the afghan out, she is right there snuggled down. If I get up, she’ll come wait for me until I sit back down. I haven’t weighed her but I swear she must have gained a pound or two this winter. Well actually all of the animals look a little chunky this winter. Katie usually doesn’t gain weight though. The animals must’ve known it was going to be a REAL winter and they needed to be prepared. I just love snow! And finally this year we are actually getting some here in St. Louis. Well, better the sunday paper than your knitting books. Abner keeps eating mine! You may have all the rest of our snow. We have more than enough already! I’m with Katie; hide in the afghan until spring!